The program is administered by National Park Service and the Internal Revenue Service in partnership with State Historic Preservation Offices. OHP's Architectural Review and Incentives Unit administers the Federal Historic Preservation Tax Incentives Program and provides consultation and architectural review based on conformance with the Secretary of the Interior’s Standards for the Treatment of Historic Properties (Standards). Planning Successful Rehabilitation Projects provides guidance on interpreting and applying the Secretary of the Interior's Standards and Guidelines for the Treatment of Historic Properties, windows, interior treatments, new additions and related new construction, modern requirements and new technologies and materials, and functionally-related complexes. 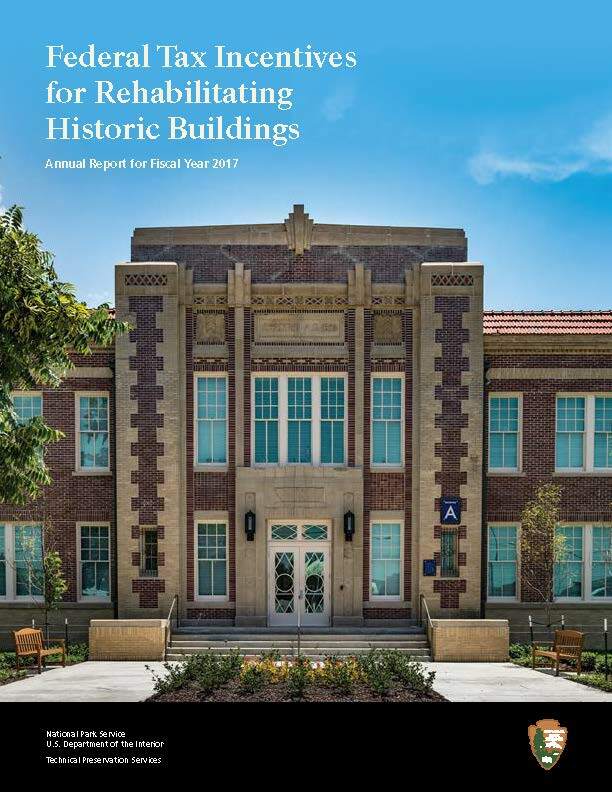 Download and review this useful NPS brochure, Historic Preservation Tax Incentives, which provides necessary information when planning a tax credit rehabilitation project. The brochure includes a note that it has not yet been edited to reflect recent tax code changes. What have the Federal Historic Tax Incentives achieved for California? For a synopsis of the economic impact and leverage of the Federal Historic Preservation Tax Incentive Program in California, visit What have the Federal Historic Tax Incentives done for California? page. Technical Preservation Services has now sync'd their federal tax credit reviewer database with the on-line "Check Project Status" look-up feature and displays the real-time project status information. The link to the Status page can be found in the right column of the Architectural Review page. Applicants, consultants, and other program users are encouraged to subscribe for Update notifications. so that TPS can contact users easily to be notified of news and updates concerning the program, as well as TPS general information and guidance. The link is on the TPS home page, but here's the direct link. The 2017 Annual Federal Tax Incentives for Rehabilitation Report, listing all Tax Incentive projects by state, is available online. California ranked nineteenth in the nation in terms of certified expenses. For a complete report of 2017 and earlier Tax Credit projects, visit the Certified California Tax Incentive Projects page. On December 22, 2017, Public Law No: 115-97 (Pub. L. 115-97) was signed and enacted, amending the Internal Revenue Code subsection 47 to reduce tax rates and modify policies, credits, and deductions for individuals and businesses. Pub. L. 115-97 (Sec. 13402) modifies the 20% Historic Rehabilitation Tax Credit as well as provides certain transition rules. These and other changes to the Internal Revenue Code may affect a taxpayer's ability to use the 20% Historic Tax Credit. Pub. L. 115-97 also repeals the 10% Rehabilitation Tax Credit for non-historic buildings. The text of Pub. L. 115-97 is available at www.congress.gov. Don't let this happen to you or your client: the return of a tax credit application due to a technical mistake or incomplete form. The information, hyperlinks and checklist provided in Completing a Successful Tax Credit Project Application will practically guarantee that your tax credit application will not be returned due to common yet preventable errors. Download this guidance today! Don't let this happen either: The return of an application because the photos and other documentation don't meet the National Park Service criteria. Download guidance for NPS Documentation submittals. Due to the uneven quality of photo submittals, OHP can only accept individual, unbound, 4" x 6" or larger color photos on glossy photo stock, properly labeled on the back or photo margin ONLY. Any other format will be returned. Refer to Park Service criteria above for the approved format. OHP has recently been experiencing lack of Standards compliance due to the use of Design-Build mechanical installations which were not coordinated with tax credit review. Use of the Design-Build process risks the loss of tax credits due to lack of proper review. Make the design team aware of character-defining features of the project and the need for review of any impact to those features. The NPS has revised the Historic Preservation Certification Application forms and instructions. Applicants should begin using the 2014 applications immediately. Current forms all display "rev. 2014" at the top right hand corner of the form. Applicants must now check a box in Item 4 stating whether or not they are the fee-simple owner of the property discussed in the application. If an applicant is not the fee-simple owner, the applicant must attach a written statement from the owner stating that the owner is aware of the application and has no objection to it. These boxes must be checked; otherwise the form is returned for resubmittal. Applications submitted on forms other than "rev. 2014" will be returned to the Applicant for resubmission. All Part 2 and Part 3 applications will be billed by TPS and payment will be made through Pay.gov, the US Department of the Treasury’s electronic payment system, by credit card or ACH bank payment. Upon receipt of a Part 2 or Part 3 application, TPS will generate an invoice delivered by email. Invoices for applications without email addresses will be mailed via the United States Postal Service. Please note that the email addresses will be used only for billing; all certification decisions will still be delivered in hard copy via USPS. Please note that NPS Technical Preservation Services, which reviews the federal historic preservation tax incentive program applications, has just completed their office relocation. Phone numbers and email addresses have remained the same. A new fax number will be assigned shortly. The National Park Service has adopted a plan designed to improve the Federal Historic Rehabilitation Tax Credit Program. The plan, Making a Good Program Better, Final Guidance and Implementation of National Park System Advisory Board Recommendations for the Federal Historic Rehabilitation Tax Credit Program (December 2007) implements recommendations made by the National Park System Advisory Board following a two-year effort. Planning Successful Rehabilitation Projects provides new guidance for interpreting and applying the Secretary of the Interior's Standards for Rehabilitation for projects involving windows; interior treatments; new additions and related new construction; codes, energy efficiency, and new materials; and very large, functionally-related, multiple-building complexes.